It is hard to imagine a fall season without a pair of brown boots. The brown boots are of different textures and designs. One of the most popular models, which is always presented in the designer collections is suede ankle boots with lower or higher heels. Even though it is a very popular model, not everyone knows how to pair it with other pieces of the wardrobe to create a million of different, but still stylish looks. So, how to complement a pair of brown boots this year to look chic and beautiful? If you adore wearing ankle boots in autumn like a lot of celebrities do, you have tons of options for every day. Get inspired by celebrities like Lily Aldridge, Jennifer Garner and Hilary Duff to rock a pair of brown boots this season like a pro. Brown boots can be easily found both in the mass market (Topshop, Forever 21, Zara, etc.) and luxury brands (Sam Edelman, Saint Laurent, etc.) every year. Since you have the boots, use the ideas below to find your signature style. The first look has the casual, fun vibe. Complement a pair of suede ankle boots with a black tank dress and a light denim jacket. Add a brown shoulder bag, which perfectly goes together with the color of the boots. You don’t have to pick the same shade of brown for both boots and bag. A bag can have a slightly lighter shade. This outfit is simple, but cute. For the next look, get a pair of white shorts and a long tunic in tortilla or olive shade. Complement this with a pair of ankle boots and a leopard-print scarf. This outfit is perfect for the beginning of the fall season when the weather is still pretty warm. 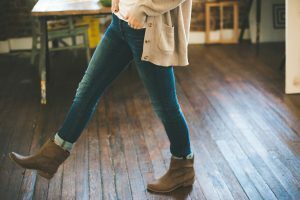 Style a pair of light-brown suede boots with a baggy sweater in mocca and a pair of boyfriend jeans rolled up a little bit. Finish the outfit with a dark shopper bag and a pair of black sunglasses. You are ready to go. For the next look, add a pop of color. You can wear the same light suede boots with a pink fuzzy sweater and a pair of light skinny jeans. Complement them with a brown bag, which perfectly goes together with brown shoes. And the last but not the least, complement brown shoes with a leopard print skirt and a tucked in white T-shirt. Add a black bomber jacket on top. Complement this look with a black backpack and delicate jewelry pieces. So, don’t hesitate about wearing brown boots in the fall. This piece of wardrobe is never out of fashion, especially when the weather is not too hot already and not too cold yet. Go and check your closet right away to see if you have those pieces, which can perfectly go with a pair of ankle boots.